As Marvel moved into the 1970s, they tasted their first failures since 1961. 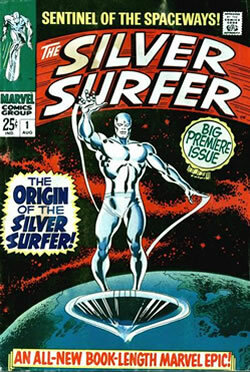 Stan Lee's flagship comic, The Silver Surfer, was cancelled due to poor sales. But this wasn't going slow Marvel down. 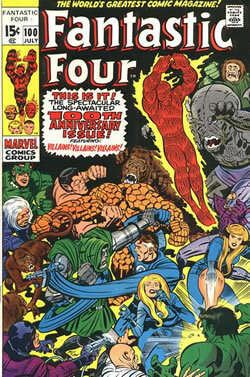 More bad news for Marvel was comic when Jack Kirby abruptly quit Marvel after drawing Fantastic Four 102. Kirby had felt that he hadn't been given the recognition he deserved for the Marvel line of characters. As Stan moved to the role of Publisher and Roy Thomas became Editor, Thomas brought new influences to bear. His first pet project was a comic version of R.E.Howard's pulp hero Conan the Barbarian. Ironically, while the majority of the run of Silver Surfer was drawn (brilliantly) by John Buscema, it wasn't until the comic was about to be cancelled that creator Jack Kirby returned to draw The Silver Surfer the last issue, 18. (Roll over the image above with your mouse to see the cover of issue 18). Despite Kirby's disgruntlement, there's no denying his huge creative influence over the development of the Fantastic Four comic and his record-breaking run of 102 issues is filled with awesome creativity that Stan Lee was only too quick to acknowledge. 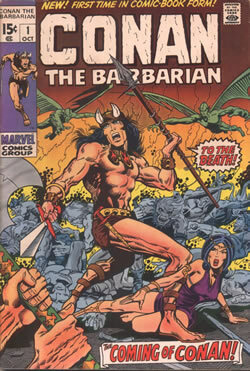 Conan the Barbarian was drawn by emerging British talent Barry Smith. Smith brough a Pre-Raphaelite influence to the art which seemed to fit the character perfectly.